At Sables d'Olonne, in the heart of the very quiet area of ​​La Chaume, close to the sea, this charming house offers a pleasant and relaxing holiday. The preservation of old materials combined with a personalized and stylish decor, the house reflects the spirit of old houses with their chaumoises many small nested constructions. The house is rented for 5 people and has 2 beautifully appointed bedrooms: a master bedroom with a double bed 140x190 and a bedroom with 2 beds 80x190 (possibility of adapting 1 bed 160x190). 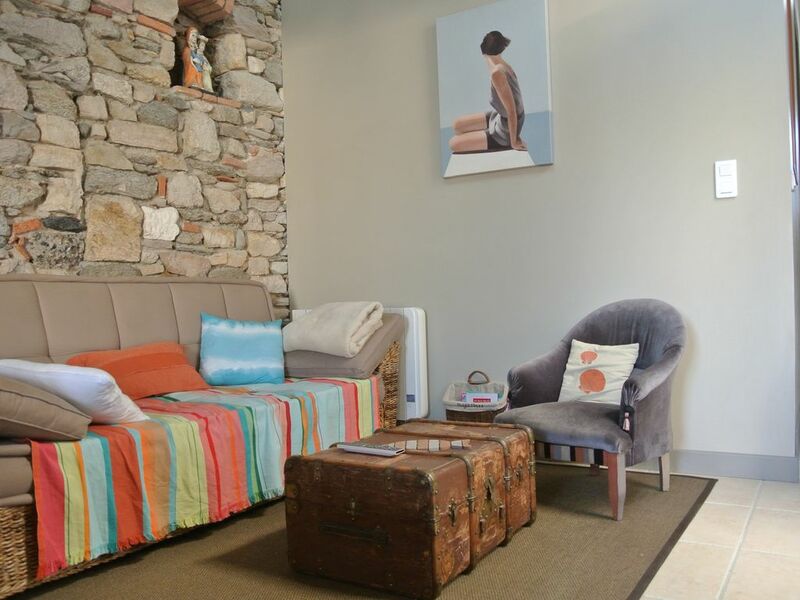 It also has a large living room with tempered dining-room, living room (with TV WIFI internet access flat- screen), loft (reading area and relaxation) providing additional sleeping and fully equipped kitchen, walk-opening on a beautiful landscaped terrace of 30 m2 (table, chairs and wooden garden furniture). The house also houses a charming garden adjoining a small garden at the back which allows the storage room Bicycle storage (access is possible to the terrain background). The bathroom is well lit by a skylight; The shower has 2 shower heads and a glass wall. The toilets are independent. The terrace adjoins the spacious living room is extended by a charming landscaped garden. On the other hand attached to the house, a closet can store beach equipment, fruit and vegetable market, cleaning products and garbage ... He asked not to smoke inside the house. We were met on arrival by Msr. Marquis and his son with a warm and welcoming greeting and the moment we went into the cottage we knew we had found a winner. It is a lovely cottage, full of character, clean and tidy, and fully equipped with everything you could need (oven, microwave, coffee maker, bed linen, towels, dishwasher, BBQ, tv, stereo etc). The beds were comfortable and the shower was excellent and all this with the bonus of a little garden (with fruit and veg. to hand) in which to relax after a hard day on the beach and enjoy a glass of wine. A short walk away to the boulangerie and a small store or to countless places to have a meal. The ferry across the harbour costs a modest 1 euro and takes you the expanse of the beach and more eating places as well as a shopping area. We have no hesitation in giving this cottage a 5 star rating......it is the best property we have ever stayed in and we are hoping that we will be able to return in the not too distant future. It is difficult to imagine how anybody could stay in this cottage and not be satisfied. Wir können uns den Bewertungen der anderen Rezensenten nur anschließen: Reizende Vermieter, geschmackvolle Einrichtung im maritimen Stil, stiller angenehmer Garten in dem man auch noch die üppigen Gemüsebeete "räubern" darf! Bäcker, Fleischer, Fischer und eine mit allen regionalen Genüssen gefüllte Markthalle sind um die Ecke. Die Restaurants am Kanal haben ein fantastisches Preis-/Leistungsverhältnis und bieten einen hübschen Blick auf Sables, den Hafen und den Schiffsbetrieb. Und die formidablen Strände entlang des Forêt d'Olonne waren geradezu lächerlich leer! Und wenn die Côte de Lumière ihrem Namen alle Ehre macht, wie in den 9 Tagen, die wir hier verbracht haben, dann waren Erholung und Erlebnis: siehe Überschrift. Wir kommen sehr bald wieder! Versprochen!!! Des propriétaires charmants et prêts à partager les bonnes adresses, les visites à faire... Une location parfaite pour des vacances avec des enfants: la maison est bien agencée, bien équipée, décorée avec goût et confortable. Le très beau jardin avec terrasse permet de profiter du calme de la maison et du quartier de la Chaume, le potager que les enfants allaient visiter chaque jour pour la cueillette des tomates, des courgettes et des fraises est mis à notre disposition. Le quartier de la Chaume est très agréable, calme et vivant à la fois, proche de toutes les commodités. Nous avons passé d'excellentes vacances sous le soleil vendéen, profitant tous les jours de la plage de la Paracou. Merci M. et Mme Marquis! Wir waren nach 2014 und 2015 zum dritten Mal bei Chantal und Jean zu Gast. Für uns beide ist dieses gut ausgestattete Haus eine Oase der Erholung dank seiner liebevollen Einrichtung und des kleinen, aber sehr schön gestalteten Gartens. Der Clou ist der Gemüsegarten, der einen je nach Jahreszeit mit schmackhafter Frischware aller Art versorgt. Fußläufig erreichbar sind zwei hervorragende Bäcker, der Austernfischer, eine kleine Markthalle, zwei Weingeschäfte und einige Restaurants. Die weitläufigen Strände, die sich vor dem 15 km langen Forêt d'Olonne erstrecken, sind - in der Vor- & Nachsaison - nahezu menschenleer. Das herzliche Ehepaar Marquis und ihr kleines Fischerhäuschen werden uns noch einige Male wiedersehen! Jens und Henrik aus Berlin freuen sich. This restored in 2012, is located in La Chaume typical district of Les Sables d'Olonne on the Vendée coast, coast of light. It enjoys a privileged location; in a few minutes you will reach the BEACH 'LA PARACOU', 'THE GREAT BEACH' fine sand Sables d'Olonne, or seawater pool The Thatch. Nearby you can enjoy the shops, cafés, restaurants, banks of The Thatch, ... and many leisure activities (beach, bike trails, hiking in the salt marsh or forest d'Olonne, go canoeing, sailing , surf, movies, bowling, golf, spa ...). In a street plunging into the ocean on one side, and on the PORTS and RECREATIONAL FISHING in the other, the house is in the heart of a warm area to the soothing atmosphere, an inlet of Sables d'Olonne, its embankment and its known port for the legendary race 'Vendee Globe'.